Rally is a form of motorsport that takes place on public or private roads with modified production or specially built road-legal cars. It is distinguished by running not on a circuit, but instead in a point-to-point format in which participants and their co-drivers drive between set control points, leaving at regular intervals from one or more start points. Rallies may be won by pure speed within the stages or alternatively by driving to a predetermined ideal journey time within the stages. Sports car racing is a form of motorsport road racing which utilizes sports cars that have two seats and enclosed wheels. They may be purpose-built (Prototype) or related to road-going models. Marshal Ferdinand Jean Marie Foch was a French general and military theorist who served as the Supreme Allied Commander during the First World War. 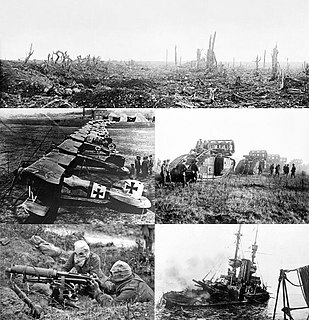 An aggressive, even reckless commander at the First Marne, Flanders, and Artois campaigns of 1914–1916, Foch became the Allied Commander-in-Chief in late March 1918 in the face of the all-out German spring offensive, which pushed the Allies back using fresh soldiers and new tactics that trenches could not contain. He successfully coordinated the French, British and American efforts into a coherent whole, deftly handling his strategic reserves. He stopped the German offensive and launched a war-winning counterattack. In November 1918, Marshal Foch accepted the German cessation of hostilities and was present at the armistice of 11 November. He won his first local race, the Grand Prix de Comminges of 1926, at Saint-Gaudens, near Toulouse, and went on to drive a Bugatti and an Alfa Romeo P3 to victories in the Marseille Grand Prix, the Circuit of Masaryk, and the Spanish Grand Prix. In the Indianapolis 500 of 1929, he drove a Delage to 7th place. He won the 1931 Monaco Grand Prix—the only Monégasque driver to have won his home grand prix—and in 1933 he partnered with specialist endurance racer Luigi Chinetti to win the Spa 24 hours race. Saint-Gaudens is a commune and a sub-prefecture of the Haute-Garonne department in southwestern France. Automobiles Ettore Bugatti was a French car manufacturer of high-performance automobiles, founded in 1909 in the then-German city of Molsheim, Alsace by the Italian-born industrial designer Ettore Bugatti. The cars were known for their design beauty and for their many race victories. Famous Bugattis include the Type 35 Grand Prix cars, the Type 41 "Royale", the Type 57 "Atlantic" and the Type 55 sports car. Automobiles Talbot S.A. was a French automobile manufacturer based in Suresnes, Hauts de Seine, outside Paris. Hellé Nice was a French model, dancer, and a Grand Prix motor racing driver. The Monte Carlo Rally or Rallye Monte Carlo is a rallying event organised each year by the Automobile Club de Monaco which also organises the Formula One Monaco Grand Prix and the Rallye Monte-Carlo Historique. The rally now takes place along the French Riviera in the Principality of Monaco and southeast France. Previously, competitors would set off from all four corners of Europe and ‘rally’, in other words, meet, in Monaco to celebrate the end of a unique event. From its inception in 1911 by Prince Albert I it was an important means of demonstrating improvements and innovations to automobiles. Paired with the Swiss driver Ciro Basadonna, Chiron won the 1954 Monte Carlo Rally, and achieved podium finishes in the fifteen Formula One races he entered that year. His last race was in 1955,  when he took a Lancia D50 to sixth place in the Monaco Grand Prix a few weeks before his 56th birthday,  becoming the oldest driver to compete in a Formula One race. He is also the oldest driver ever to have entered for a Formula One race, taking part in practice for the 1958 Monaco Grand Prix when he was 58. The Lancia D50 was a Formula One racing car designed by Vittorio Jano for Lancia in 1954. The car's design made use of many innovative features, such as the use of the engine as a stressed chassis member, the off-centre positioning of the engine to allow a lower overall height, and pannier fuel cells for better weight distribution and aerodynamics. Six of the cars were built, and two of them are displayed in Italian museums. The 1955 Monaco Grand Prix was a Formula One motor race held at Monaco on May 22, 1955. It was race 2 of 7 in the 1955 World Championship of Drivers and was given an honorary name, Grand Prix d'Europe. The 100-lap race was won by Ferrari driver Maurice Trintignant after he started from ninth position. Eugenio Castellotti finished second for the Lancia team and Maserati drivers Jean Behra and Cesare Perdisa came in third. The 1958 Monaco Grand Prix was a Formula One motor race held on 18 May 1958 at Monaco. It was race 2 of 11 in the 1958 World Championship of Drivers and race 2 of 10 in the 1958 International Cup for Formula One Manufacturers. The race was the 16th Monaco Grand Prix and was held over 100 laps of the three kilometre circuit for a total race distance of 314 kilometres. The Monaco Grand Prix is a Formula One motor race held each year on the Circuit de Monaco. Run since 1929, it is widely considered to be one of the most important and prestigious automobile races in the world and, with the Indianapolis 500 and the 24 Hours of Le Mans, forms the Triple Crown of Motorsport. The circuit has been called "an exceptional location of glamour and prestige". 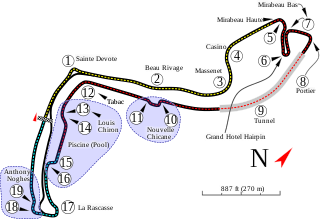 The French Grand Prix, formerly known as the Grand Prix de l'ACF, is an auto race held as part of the Fédération Internationale de l'Automobile's annual Formula One World Championship. It is one of the oldest motor races in the world as well as the first "Grand Prix". It ceased shortly after its centenary in 2008 with 86 races having been held, due to unfavourable financial circumstances and venues. The race returned to the Formula One calendar in 2018 with Circuit Paul Ricard hosting the race. Maurice Bienvenu Jean Paul Trintignant was a motor racing driver and vintner from France. He competed in the Formula One World Championship for fourteen years, between 1950 and 1964, one of the longest careers in the early years of Formula One. During this time he also competed in sports car racing, including winning the 1954 24 Hours of Le Mans race. Following his retirement from the track Trintignant concentrated on the wine trade. Achille Varzi was an Italian Grand Prix driver. Luigi Cristiano Fagioli, nicknamed "the Abruzzi robber", was an Italian motor racing driver. He is currently the oldest driver to win a race in Formula One, also being the only race winner born outside the 20th century. The Grand Prix du Comminges was an automobile race held in France. Luigi Villoresi was an Italian Grand Prix motor racing driver who continued racing on the Formula One circuit at the time of its inception. Philippe Étancelin was a French Grand Prix motor racing driver who joined the new Formula One circuit at its inception. Victor Henry Elford is a former sportscar racing, rallying and Formula One driver from England. He participated in 13 World Championship F1 Grands Prix, debuting on 7 July 1968. He scored a total of 8 championship points. René Dreyfus was a French driver who raced automobiles for 14 years in the 1920s and 1930s, the Golden Era of Grand Prix motor racing. Clivio Piccione is a Monegasque race car driver. He raced in the 2005 GP2 Series season for the Durango team and David Price Racing for 2006. Sir Henry Ralph Stanley "Tim" Birkin, 3rd Baronet was a British racing driver, one of the "Bentley Boys" of the 1920s. Guillaume Laurent "Guy" Moll was a French racing driver. Formula Libre is a form of automobile racing allowing a wide variety of types, ages and makes of purpose-built racing cars to compete "head to head". This can make for some interesting matchups, and provides the opportunity for some compelling driving performances against superior machinery. The name translates to "Free Formula" – in Formula Libre races the only regulations typically govern basics such as safety equipment. The 1931 Monaco Grand Prix was a Grand Prix motor race held at the Circuit de Monaco on 19 April 1931. The Automobile Club de Monaco is a motoring club based in Monaco. The club serves as the governing body for motorsport within Monaco, and organises the prestigious Monaco Grand Prix and Monte Carlo Rally. It is a member of the Fédération Internationale de l'Automobile, representing Monaco as a mobility and sporting club. There have been 5 Formula One drivers from Monaco. 1 2 "Louis Chiron – Monaco". ESPN. Retrieved 28 August 2018. 1 2 3 "Louis Chiron – Biography". Motor Sport Magazine. Retrieved 28 August 2018. ↑ "Drivers – Louis Chiron". grandprix.com. Retrieved 28 August 2018. ↑ Neil, Dan (8 December 2004). "In pursuit of the Queen of Speed". Los Angeles Times. Retrieved 4 February 2016. ↑ Grimes, William (24 December 2004). "A Racing Life: Plenty of Men and Fast Cars". The New York Times. Retrieved 4 February 2016. 1 2 Spurgeon, Brad (22 August 2009). "Measuring Experience in Youthful Formula One". The New York Times. The New York Times Company. Retrieved 4 February 2016. ↑ "1955 Monaco Grand Prix". Motor Sport Magazine. Retrieved 4 February 2016. ↑ "All Results of Louis Chiron". racingsportscars.com. Retrieved 19 October 2017. ↑ "THE GOLDEN ERA – OF GRAND PRIX RACING". kolumbus.fi. Retrieved 11 October 2017. ↑ "Louis Chiron – Involvement". StatsF1. Retrieved 28 August 2018. 1 2 "Louis Chiron – the Monegasque Gentleman Driver". montecarlodailyphoto.com. Retrieved 28 August 2018. ↑ European Car, Volume 37, Issues 7–12. Argus Publishers. 2006. p. 106. ↑ Taylor, Michael. "Bugatti Chiron blasts into Geneva with nearly 1,500 hp". Autoblog. Retrieved 28 August 2018. Wikimedia Commons has media related to Louis Chiron .